With hometown hospitality, the people of Syracuse bid you a friendly welcome and invite you to enjoy the many attractions of this delightful German, business and agricultural community. The active community has services to make you visit comfortable with year round camping, motels, seasonal swimming, bowling, bike-walk paths, golf, a good hospital, and a fitness center. Downtown has specialty gift shops, a recently restored quilt shop, Art Gallery, and antique stores in addition to full shopping and services. On the south edge of town, a seasonal business offers old-fashioned ice cream treats. The highlight of the year occurs each September when the Syracuse Germanfest livens up the whole town with German style entertainment, food, beer, crafts, and music. The first root for the present town of Syracuse was planted in the late 1850s when a school was established. This, however, was not the original site from whence the name originated. The name appeared at a site in 1856, nearly six miles west of its present location where salt was discovered. To claim the land, the "Syracuse Town Company" was formed. Named for the great salt entity in New York, it was hoped that a similar market would develop. Salt mining was not successful and it soon died down, but the name was not forgotten. In 1869, when talk of a railroad coming through the area got serious, a Mr. Thorn gave 100 acres of land to the Midland Pacific Railway, and Dr. J. N. Converse and L.E. Sinsabaugh laid out a town. In 1871, when the railroad was completed to Lincoln, the station was given the name "Syracuse." The importance of the railroad was immediately felt. As Syracuse became a major shipping point in the county, buildings sprang up at a rapid pace and the town was incorporated on January 6, 1875. Syracuse also grew as an agricultural center. In 1878 over 350 cars of grain and 100 carloads of livestock were shipped from this station. The original town was built primarily on the bottomland near the tracks, but it gradually moved to the higher ground. By 1879 the population was upwards of 500 residents, and in 1882 over 80 services were listed, including a carriage factory. A stone quarry was developed five miles from Syracuse. Some of its light-gray stone was used to build the state penitentiary at Lincoln. The activity which came in the early 1900s provided a strong basis for the town, and made it appear much more advanced than other communities its size. As the railroad era diminished, Syracuse did not die. Instead it recognized its reason for existence -- the rich soil on which it had been founded and the agricultural potential of it. 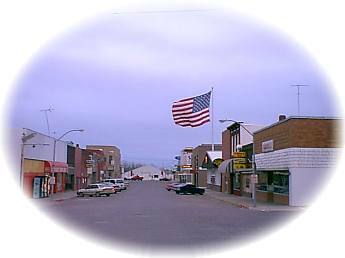 Syracuse stands as an example of the struggles and successes endured to became an established town on the Nebraska prairie. St. Paulinus Catholic Church - Poplar and 5th St.
Syracuse Baptist Church - 254 7th St.